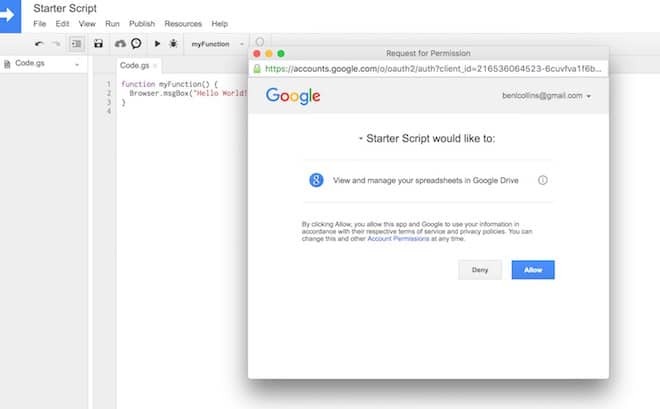 Google Apps Script is a cloud based scripting language for extending the functionality of Google Apps and building lightweight web-based applications. 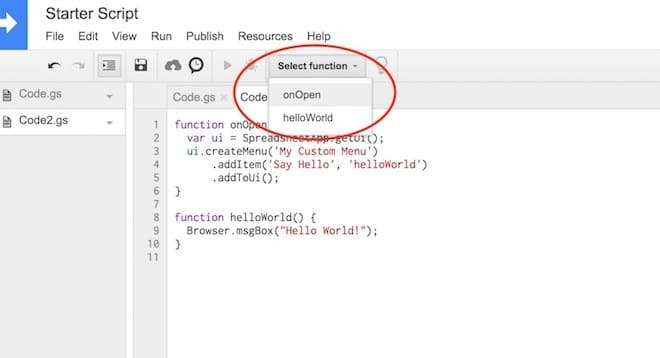 What does this mean in practice: It’s a coding language where you can write small programs performing custom behaviors that go beyond the standard features of Google Apps. The code is stored and executed on Google’s servers. It means you can do cool stuff like automating repetitive tasks, creating, modifying and emailing documents to people, and linking up your Google Sheets to other data sources. Heck, you can even build complex web forms, use a Google Sheet as your database, programatically create charts and publish it all to the web. In other words, you can build fully featured, lightweight web applications. In this Google Sheets script tutorial, we’re going to write a script that is bound to our Google Sheet, or you might say contained within our Google Sheet. This is known in the jargon as a container-bound script. Let’s write our first, extremely basic program, the classic “Hello world” program beloved of computer teaching departments the world over. Begin by creating a new Google Sheet. Then click the menu Tools > Script editor... to open a new tab with the code editor window. 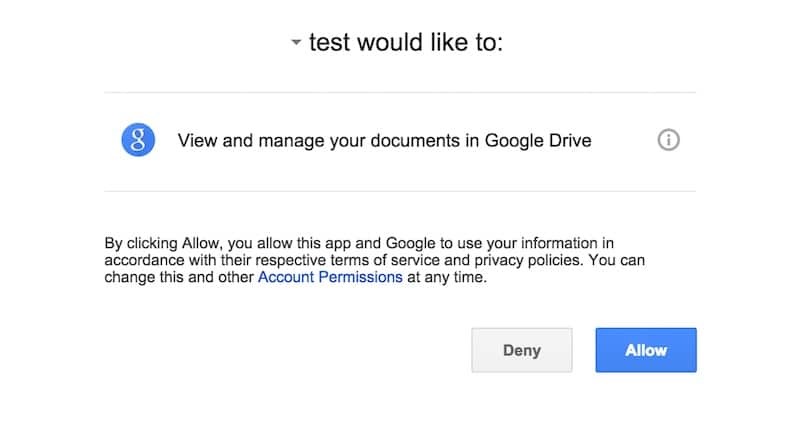 Google have robust security protections to reduce risk from unverified apps, so we go through the authorization workflow when we first authorize our own apps. ❗️When your first run your apps script, you may see the “app isn’t verified” screen and warnings about whether you want to continue. In our case, since we are the creator of the app, we know it’s safe so we do want to continue. Furthermore, the apps script projects in this post are not intended to be published publicly for other users, so we don’t need to submit it to Google for review (although if you want to do that, here’s more information). Next, Google Apps Script will show you two status messages to tell you what’s happening. If anything goes wrong with your code, this is stage when you’d see a warning message (instead of the yellow message, you’ll get a red box with an error message in it). Now, assuming you got those two yellow status messages and they’ve both automatically disappeared from view, then your program has run successfully. Click back on the browser tab with your spreadsheet (most likely the tab to the left of the one we’re in). Click on Ok to dismiss. Great job! You’ve now written your first apps script program. We should rename our function to something more meaningful. At present, it’s called myFunction which is the default, generic name generated by Google. Every time I want to call this function (i.e. run it to do something) I would write myFunction(). This isn’t very descriptive, so let’s rename it to helloWorld(), which gives us some context. Note, it’s convention in Apps Script to use the CamelCase naming convention, starting with a lowercase letter. Hence, we name our function helloWorld, with a lowercase h at the start of hello and an uppercase W at the start of World. In its current form, our program is pretty useless for many reasons, not least because we can only run it from the script editor window and not from our spreadsheet. Let’s fix that by adding a custom menu to the menu bar of our spreadsheet, so that a user can run the script within the spreadsheet without needing to open up the editor window. If you look back at your spreadsheet tab in the browser now, nothing will have changed. You won’t have the custom menu there yet. We need to re-open our spreadsheet (refresh it) or run our onOpen() script first, for the menu to show up. Another great way to get started with Apps Script is by using Macros. 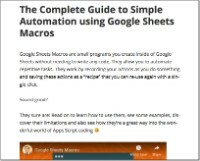 Macros are small programs in your Google Sheets that you record so that you can re-use them (for example applying a standard formatting to a table). 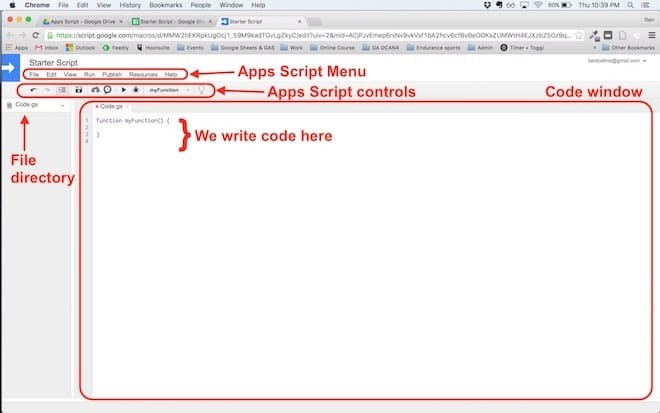 They use Apps Script under the hood so are a great way to get started in seeing what you can do. Let’s create a custom function with Apps Script, and also demonstrate the use of the Maps Service. We’ll be creating a small custom function that calculates the driving distance between two points, based on Google Maps Service driving estimates. Copy the following code into the Apps Script editor window and save. 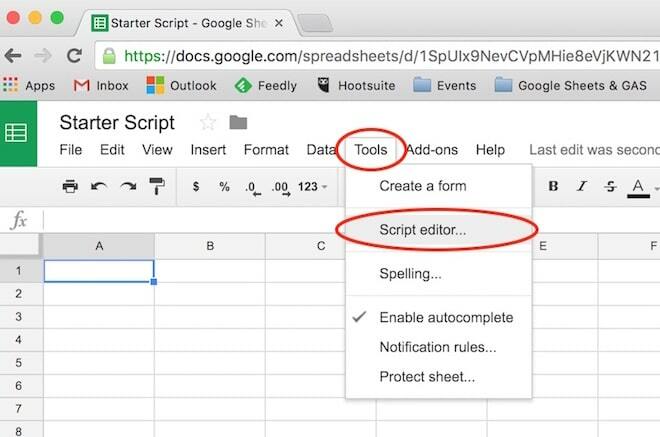 First time, you’ll need to run the script once from the editor window and click “Allow” to ensure the script can interact with your spreadsheet. Let’s take a look at another simple use case for this Google Sheets Apps Script tutorial. In this script, I’ve created a custom menu (as we did above) to run my main function. The main function, saveData(), copies the top row of my spreadsheet (the live data) and pastes it to the next blank line below my current data range as text, thereby “saving” a snapshot in time. See this post: Saving Data in Google Sheets, for a step-by-step guide to creating and running this script. to whatever you want it to be, e.g. 12. Return to your Google Doc now. 14. Click on Insert Symbol and you should see the symbol inserted wherever your cursor is. Use the Logger class to output text messages to the log files, to help debug code. The log files can be accessed after the program has finished running, by going to View > Show Logs (or Cmd + Enter, or Ctrl + Enter (on PC)). The syntax in its most basic form is Logger.log(something in here). This records the value(s) of variable(s) at different steps of your program. I’ve only scratched the surface of the outermost epidermis, not even millimeters deep, of what’s possible using GAS to extend the Google Apps experience. 1) A Sheets/web-app consisting of a custom web form that feeds data into a Google Sheet (including uploading images to Drive and showing thumbnails in the spreadsheet), then creates a PDF copy of the data in the spreadsheet and automatically emails it to the users. And with all the data in a master Google Sheet, it’s possible to perform data analysis, build dashboards showing data in real-time and share/collaborate with other users. 2) A dashboard that connects to a Google Analytics account, pulls in social media data, checks the website status and emails the user if it goes down, and emails a summary screenshot as a PDF at the end of each day. Start writing more advanced scripts with the official Apps Script starter guide – a more advanced Hello World program! Going GAS by Bruce Mcpherson is a newly published (i.e. 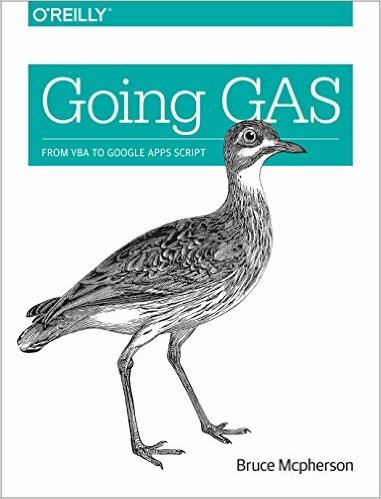 bang up-to-date as of April 2016) book covering the entire GAS ecosystem, with a specific focus on making the transition from Office/VBA into Google Apps/GAS. Even if you don’t use Office or VBA much or at all, it’s still a very useful resource. It’s been a few years since I’ve done any serious VBA work, but I still found the book very helpful and a great overview of the GAS environment. 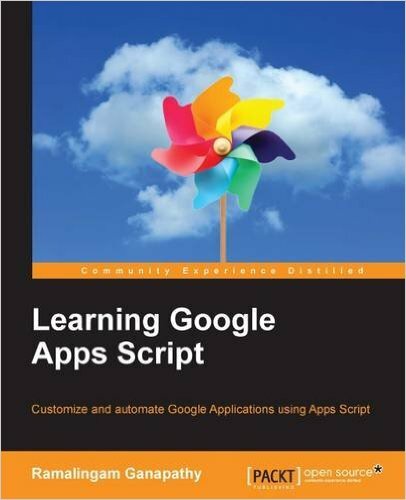 Learning Google Apps Script by Ramalingam Ganapathy is another brand new Google Apps Script book, intended for learning Apps Script. I haven’t used this particular book. Imagination and patience to learn are the only limits to what you can do and where you can go with GAS. I hope you feel inspired to try extending your Sheets and Docs and automate those boring, repetitive tasks! 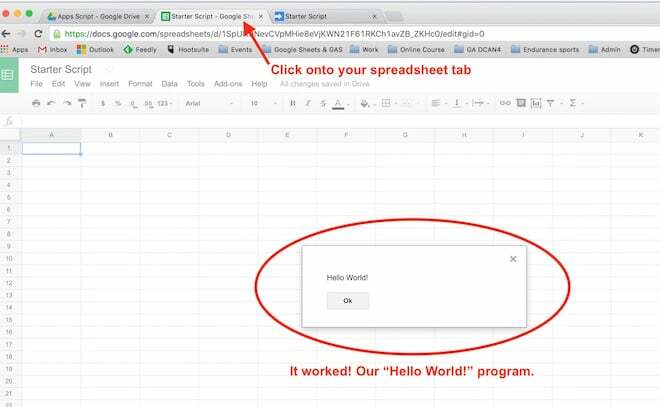 Google Sheets Macros are small programs you create without needing any code. You record your actions so you can repeat them and save yourself time! 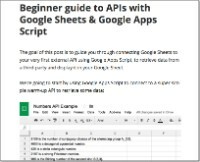 How to connect to your very first external APIs with Google Apps Script to retrieve data from third-parties and display it in your Google Sheet. 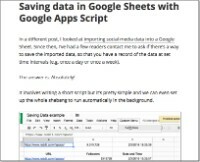 Learn how to use a few lines of Apps Script code to quickly and easily save your data in Google Sheets. You can even schedule backups automatically! @Rishu, were you able to fix it? I’m facing the same problem. Strangely enough it doesn’t happen all the time, script works several times and then suddenly starts giving the error. I have searched the web and it seems to be a recurring problem with no definite answer. Any help will be appreciated. How far did you get with project number 1 above. Kindly share a tutorial. Hi Ben – Awesome work! Like Cromwel, I would love to hear more on your project#1. Thank you for sharing. 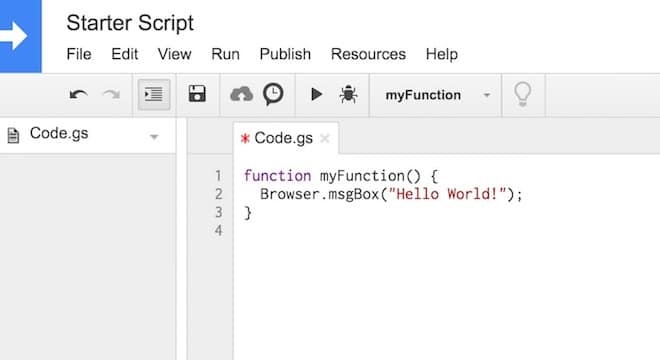 Hi, Im writing some code in google script, but when I open de file, my script doesn’t work until the first minute i Think, its like there is a delay before the script really respond to my calls on buttons, do you know why is this happening? Hmm, there shouldn’t be any substantial delay, certainly not a minute. The script could be affected by your internet connection speed, but I wouldn’t expect to see such a big delay, especially if other web services load normally. I suggest sharing your question/code on the Apps Script forum here: https://plus.google.com/u/0/communities/102471985047225101769 where there’s a community of experts who can suggest specific fixes. Thanks for very well written article that even a beginner like myself could understand! What resources/training courses/tutorials on Google App scripts you would advise to a person that have no previous knowledge of programming. Hi Sat, there’s a list of resources at the end of this post which is where I’d start. Then try creating your own scripts and googling for answers when things don’t work. The forums are very helpful at answering specific questions. I’ve tested your “Custom function/maps example” paragraph, but I’ve an error ! When I validate the formula in spreadsheet it says: TypeError: Unable to read the “legs” property from undefined. (Line 12). This happens if the cell being referenced by the function (e.g. cell A8 in the pubic spreadsheet I provided) is made an invalid location (e.g. “XASD*&^”). So perhaps one of our locations isn’t something that Google Maps can uniquely identify as a location. Try cut/pasting it into maps.google.com to see how it responds. Thanks for sharing your solution Sebastian! I found that if the location is one of several that would be returned from a Maps search, an error is displayed. No real surprise there. You have to specify enough detail to make it unique. Here in the UK I was searching for ‘Dover’, but until I put ‘Dover, Kent’ the distance was not displayed. Interesting, thanks for sharing Gary. I’ve never taken this function beyond this very basic example for illustration, but clearly you could improve the error handling and give this kind of feedback to a user. Cheers! I found the dashboard that connects to a Google Analytics account, pulls in social media data, checks the website status and emails really amazing and extremely useful. Do you plan to share it or to make a tutorial on how to built a dashboard like that? 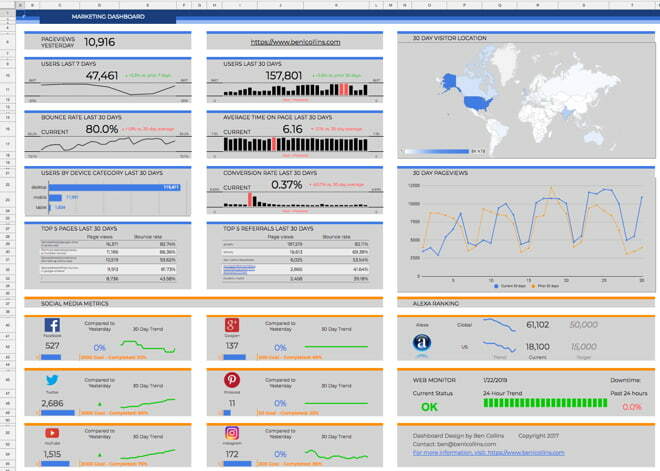 That dashboard is covered in depth in the online dashboard course I’m launching….next week (20th Feb)! I walk through how to create it step-by-step, including the apps scripting. P.S. There’ll be a special offer for newsletter subscribers next week (sign up form at the end of this page here). I get an error: Cannot call Browser.msgBox() from this context; have you tried Logger.log() instead? (line 2, file “Code”) when I try to run the Hello World script. Failing at the first attempt does not feel good. Do you know what the problem is? Hmm, not sure. Did you get the Authorization Required popup? What’s the exact error message you’re getting? The popup will show up in your Sheet browser tab, not the code editor tab, so you need to return to that one to the Hello World message. I did not get the authorisation pop up when I ran the script. However, i have tried it today and hit the debug icon, instead of run. This DID produce the authorisation pop up, and the function has run fine. Curious behaviour! 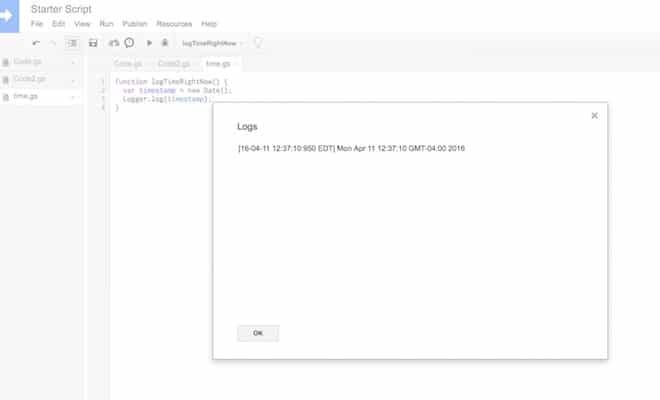 Pingback: How to load Facebook post data into Google BigQuery - Need a dashboard with Google Data Studio ? Had one weird problem when I tried the first UI example..
Have no idea what the difference is. in particular when I was testing for results less than a particular variable using var1 0 and everything worked OK.
so it’s good to teach multiple ways of doing the same thing. We have a container bound script and would like to password protect the Script Editor.Is there any way to do this or a workaround available to ensure that only the developer can access the Script Editor? I’m running in to an error with the Map distance problem. Even when I put the old values back in, it would no longer work. It’s most likely caused by ambiguity in the leg, which this basic function isn’t able to deal with. The strange thing is that even the two points that initially worked and returned the distance, also stopped working after I tried other destinations. It only worked the first time and then everything seemed to break. What a lovely article. I’m just starting to explore all the possibilities of Google App Scripting. I don’t have any main goal yet, so I’m just fiddling around a bit. 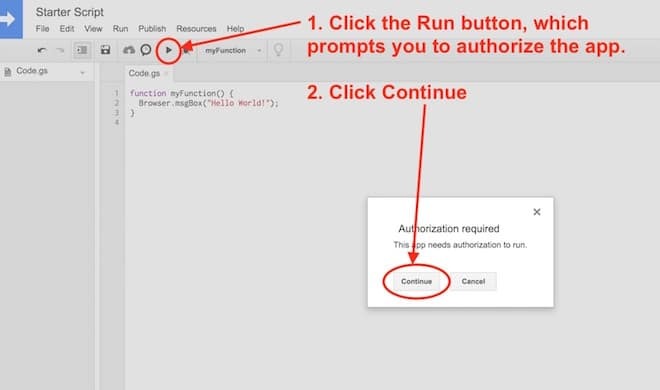 For starters I’d like to know whatever is possible with an app inside a google site, and I didn’t find any documentation on how to implement custom UI controls on the properties on the embedded app. To clarify: I add a script in my google site, then on a page I add a “Google Script App”, and add that script I just made. Then for that added ‘widget’, you can click on the edit button. I’d like to know how to add my custom settings on that page. I know it’s possible, as other existing widgets can do this too. How can I link my scripts so that all 12 run sequentially? where func1 and func2 would be the first two of your 12 functions. When you run runFuncs(), it will execute those functions inside of it, func1 and func2 in this case, but could be all your 12. I am a new user to google sheets and I love working with excel automation and advance excel. I searched about google sheet programming, and your this article become very beneficial to me. Hey Ben, I have a real beginner’s question. How do I get the “suggestion screen” on screen when I’m typing code. I have a Chromebook. Pingback: Coding Day 4 / 100 – Why learn to code? Hi Ben, I am using getcharts() to retrieve and save a manually produced chart in google sheets. I keep getting a google server error ‘We’re sorry, a server error occurred. Please wait a bit and try again. (line 4, file “Code”)’. The code is below – can you please help me with what I am doing wrong? Is it because the chart was not created with GAS in the first place? @Varun – were you able to solve this? I am getting the same error. Strangely, I am using the identical code on two sheets and only get an error on one. @Varun or Ben – did this problem ever get resolved? I’m having the same issue and can’t find the solution online. Thanks! Can you advise how I would export cvs data from an excel sheet/url to a google doc? I need it automated to occur once a week. I get the same error as Abraham Felix: ‘Cannot call Browser.msgBox() from this context; have you tried Logger.log() instead? (line 2, file “Code”)’. The Authorization window DID pop up, and I even got an email from Google saying “HelloWorld was granted access to your Google account”, but I still get the ‘Cannot call Browser.msgBox’ error. As someone pointed out above, getting an error in “Hello World” does not feel encouraging. Are you running this script from the code editor of a Google Sheet? The browser class is only available to Google Sheets, not Docs, Sites, Forms etc. I just tested it again for me and it works, so not sure why it’s not for you. and then go to the menu View > Logs in your script editor window to see the message. I was reading your post and I really enjoyed it. One quick question. Is there any way to overwrite the same file on Google Drive? I have been reading about it, but everybody mentions that Google uses IDs and that’s why is not an easy way to overwrite a file. I just found this post and I am so excited to use this for my students. I usually ran multiple mail merges within Word but this is going to save me time since my gradebook is in Google!! Do you have any more articles specifically for teachers? Maybe some in 2019 too! Haha 🤣 Great to hear an update about your work — sounds great. Thanks for checking out the site and glad it’s been useful for you. All the best for 2019! where can i found a place with the listed functions of google script? for now i just wanted one that activated my already saved filter views. I know this is late for me to comment now or whatever, but for some reason when I get on a project, where the script is supposed to be is blank. Tools and everything is there but the place for me to write scripts are blank and I can’t do anything on it. Great example, I just wish it worked. There must have been a change since it was posted. Hello! Amazing tutorial. I am trying to run the script for List Growth History, and am getting the following error “TypeError: Cannot call method “forEach” of undefined.” What does this mean and how can I fix it?